The Court also considered plea by a wildlife filmmaker for ban on exhibition and parading of elephants. The Supreme Court on Friday directed the Chief Wild Life Wardens of states to ascertain the age of all the captive elephants and supply that information to the Ministry of Environment and Forests(MoEF). The direction is to the states of Andhra Pradesh, Assam, Bihar, Goa, Karnataka, Kerala, Madhya Pradesh, Maharashtra, Manipur, Meghalaya, Nagaland, Punjab, Rajasthan, Sikkim, Tripura, Tamil Nadu and West Bengal. The bench of Justices A K Sikri and Abdul Nazeer was acting on a petition filed by Wild Life Rescue and Rehabilitation Center, an NGO, which, inter alia, seeks implement the provisions of the Wildlife (Protection) Act 1972 and the Prevention of Cruelty of Animals Act 1960 to protect elephants in captive effectively. There is also a prayer to the effect that census should be conducted of all captive elephants under the supervision of MoEF with the assistance of independent experts. we are of the view that the Chief Wild Life Warden of each State must ascertain and identify elephants in captivity in that particular State and whether the owners of these elephants have an ownership certificate. If they do not have the ownership certificate, then after following the mandatory procedures required by law, the ownership certificate may be granted provisionally subject to the final decision. That bench had kept a cut off date of December 31 . On Friday, the SC directed the exercise to be completed by February 12. In the main petition filed by the NGO in 2014, an intervention application has been filed by Sangita Iyer, a journalist and wild life film maker, who has made a documentary "Gods in Shackles" highlighting the atrocities committed against elephants in Kerala, which are primarily used for temple festivals, processions and exhibitions. Based on the research carried out for the making of the documentary, she filed the application in August 2017, narrating the illegalities committed against captive elephants in the state. She states in the petition that about 40 elephants died between January 2016 and June 2017 in Kerala due to cruel treatment. According to Sangita Iyer, Kerala has almost 21% of India's captive elephant population, and more than 90% of them are bull elephants. 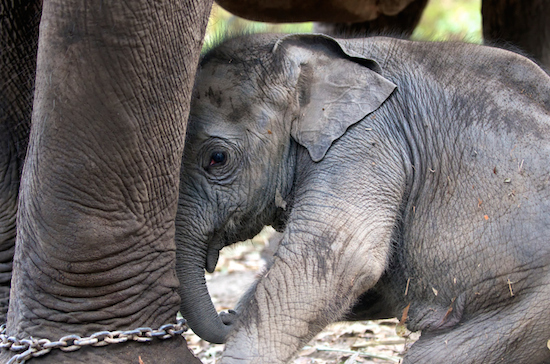 Captured mostly at very young age, the elephants are subjected to a very cruel training cycle. All captive elephants are kept in solitary confinement throughout their life in Kerala, with absolutely no chance for any kind of socialization. This coupled with other cruelty result in stereotyped movements showing huge stress and frustration among the animals. Stills from the documentary are annexed along with the petition as exhibits of acts of cruelty against the pachyderms. The petition alleges that in Kerala, elephants captured are subjected to training in various elephant camps owned and managed by the respondent State Government. The training, popularly referred to as "Chattam Padippikkal" (teaching the rules) involves prolonged and repeated torture of the elephants by mahouts. Deep fear of pain is created in the mind of the elephant with consistent use of sharp and cruel weapons. "Between November and May there are more than 3000 festivals in Kerala, most of them exploiting India's heritage animal, the endangered Asian elephants, as deemed by the International Union for Conservation of Nature (IUCN). These majestic animals are reduced to slaves, and rushed from one festival to another, standing on hot iron planks behind the truck, paraded beneath the scorching sun and deprived of food and water", the petition says. Iyer says in the petition that she was appalled to witness so many blind and wounded elephants during the Trissur Pooram Festival 2014,when she was filming for Gods in Shackles documentary. Keeping elephants in large numbers in the vicinity of fireworks causes immense stress and anxiety to the elephants, as it is not adapted to high intensity sounds and lights. She highlights that Asian Elephants were included in Part 1 of Schedule II of the Wild Life Protection Act, 1972 in 1986 as an endangered animal. So, hunting of elephants is prohibited as per Section 9 of the Act from 1986. Capture of elephants amount to 'hunting'. In Kerala, cases of capture are reported, styling them as 'accidental captures'. It is alleged that there are unfilled elephant pits, left over from the past when such captures were permitted, in the forests in State of Kerala. every person or organization, including temples, mosques, and churches that desires to exhibit any elephant as part of its festivities must have registration under the Performing Animals (Registration) Rules, 2001. There is no justification not to insist on such registration merely because there is no sale of tickets involved. The conditions stipulated in the rules show that the intention is to ensure avoiding of unnecessary pain and suffering to the animal and also to ensure that the life and limb of the general public is protected from the animals exhibited. The hiring of elephants happens with huge amounts being paid as rent (called 'ekam'). It is submitted that such hiring must be treated as transfer (albeit temporary) for commercial consideration which is expressly prohibited by 1972 Act. The Governments ought to take strict and expeditious action against those owners who hire out elephants in violation of S. 43(1) of the 1972 Act. According to the petition, it is impossible to exhibit and parade elephants in public without inflicting cruelty beyond description on them. Walking in hot sun or staying put at one place for long time are abnormal patterns of behavior of an elephant. The normal response of an elephant to fire, crackers and loud noise is to flee from that place. In the wild, fire and noise are usually used to ward off elephant attacks in wild. Therefore, the petition seeks to prohibit exhibition and parade of elephants in public as part of any kind of festivities. On Friday, the Court permitted the intervention of People For Ethical Treatment of Animals(PETA) also in the case.